Dr. Goode-Kanawati is board-certified in Family Practice and Emergency Medicine (ABPS). One of the attendees from our September Women’s Health lecture posed the question, “Do you look at testing differently than traditional medical practitioners?” Our answer? A resounding yes and YES, as in: we both look at the results differently and we often look at different results in order to treat you as a whole person. 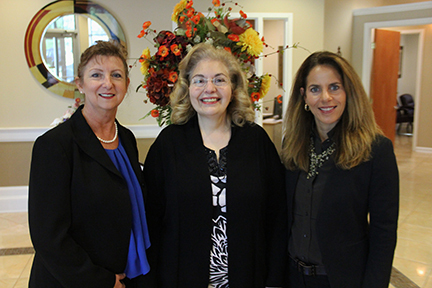 The Beverly Medical Center team: From left, Sandra L. Britt, MS APRN, ANP-C, Dr. Beverly Goode-Kanawati, DO, and Sharon Price, MS Nutrition. Looking at results differently . . .
First, as an integrative practice, we may interpret even common lab results using a different lens than traditional medical practices do. One example is thyroid function testing, where a traditional doctor might see no concern with thyroid stimulating hormone levels as high as 4 or even 5, citing the “normal” range of .45-4.5 uIU/mL. But those ranges represent an average derived from a random sampling of people, many of whom certainly had less than optimal thyroid function! That’s why we like to see TSH levels below 2.5, which we find more indicative of optimal rather than merely average thyroid function. But we also look at different indicators, sometimes simply additional ones. In the case of thyroid function, our thyroid panel includes not just TSH level, but a variety of other indicators including free hormone levels and blocking factors, along with indicators of autoimmune thyroid disease, the most common cause of thyroid malfunction in the United States. And oftentimes, we rely on different test panels altogether. While you’ve likely heard of – and almost certainly have had – a complete blood panel (CBC), have you ever heard of an Organic Acid test (OAT) or Amino Acid panel? At Beverly Medical Center, we have found these to be among the most useful tools for zeroing in on problem sources and then helping to create therapeutic plans that deliver tangible results for patients. Why? The breadth of actionable insight enables us to quickly zoom in on problem sources that translate into very real issues for patients. Take Susan*, a patient who, following the loss of her mother, seemed to lose control over her eating, rapidly gaining 20 pounds. For most of her life, Susan had been low in “get up and go,” seemingly having to push herself to get things done. Unbeknownst to her, both low motivation and disordered eating or other addictive behavior can be signs of low dopamine. Susan started therapy and was prescribed very low dose Wellbutrin, to good effect. Wellbutrin can help those with low dopamine through a “back end” mechanism, by inhibiting reuptake of it and allowing more dopamine to remain available. But eight years later, Susan found the same medication dose no longer worked for her – she was experiencing low motivation and her eating was beginning to spiral out of control again. Susan’s organic and amino acid panel illuminated her imbalances in dopamine and other neurotransmitters that can present themselves with symptoms like her addictive behavior and low motivation or with other imbalances, such as anxiety, depression, or even sleep disturbance. Knowing about her specific imbalance enabled us to work on the “front end” factors influencing Susan’s dopamine levels. We supplemented with targeted amino acid inputs – phenylalanine and tyrosine - along with B vitamin cofactors to ramp up Susan’s front-end production of dopamine. This, along with her continued low dose of Wellbutrin, enabled Susan to regain both her motivation and control over her eating. Amino acid therapy can help for a wide variety of imbalances – not just for addictive behaviors, but also for depression, anxiety, and sleep disorders. And sometimes amino acid therapy is all that is needed, allowing individuals to avoid, use lower doses, or no longer need anti-depressant or other prescription drug therapy for these types of conditions. What else can the tests tell us? Trouble metabolizing specific nutrients, like fats and carbohydrates. Missing carbs but find that they make you bloated or give you other symptoms? Targeted supplementation with certain B vitamins, lipoic acid, CoQ10, and chromium picolinate can improve how you process them. Hiccups in energy production. Tired all the time, even though you’re doing all the “right” things? Insufficient levels of amino acids or certain vitamin and mineral cofactors can cause blockages in the citric acid cycle, which can be fixed with diet and targeted supplements. Vitamin insufficiencies. Rather than looking at how much B12, B6, or folic acid you have on board, this test can indicate whether you have enough to perform necessary functions in your body. That same questioner from the lecture didn’t believe that average ranges always reflect what’s right. Right! This form of functional testing provides actionable information relative to your individual needs, rather than measuring an arbitrary level without the necessary context. Imbalances in neurotransmitters, like we saw with Susan. Again, these conditions sometimes require both nutritional and other therapies, with the expertise to manage the two safely. Looking for a new, often quickly effective addition to your toolkit to combat anxiety, depression, and other mood disorders? These tests give us the roadmap for how to help you. Other Body Burdens. Whether you have an imbalance in oxidative stress vs. antioxidant reserves, a high level of detox demand due to chemical or other exposure, or even an overgrowth of unhealthy gut flora, these tests can pinpoint both sources of challenge and your available reserves to counter those threats. And we can work to improve both, together. It’s this very ability to unlock seemingly or previously impenetrable conditions that makes the organic and amino acid test panels so valuable. Understanding which tests to look at and how to interpret them, as well as how to safely combine nutritional therapies with appropriate conventional medications and therapies is a hallmark of how we practice at Beverly Medical Center. We have both the nutritional know-how and the medical expertise to tackle your specific issues using the best integrative approach for you.